As the weather begins to warm up and the last of winter’s chill fades away, it’s natural to start thinking about spring cleaning. After all, clearing out old junk leaves room for the new beginnings symbolized by the season. 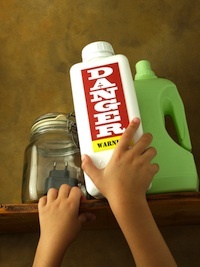 If you have children, your household mess is likely to require more attention in terms of cleaning, and the kids themselves will need to be kept safe from all those household chemicals. These tips can help you keep your brood safe and entertained while you’re cleaning the house for spring.